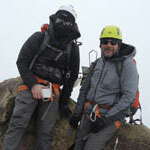 Attain the basic skills of mountaineering with a focus on safety and education in just one week. 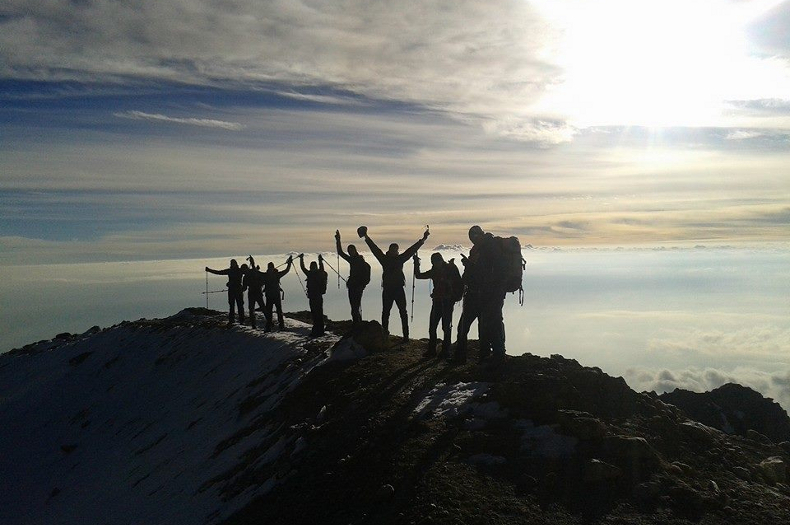 The volcanoes climbed on this trip are achievements in their own right, but also act as excellent preparation for intermediate level expeditions like Aconcagua. Climb in small teams, with a maximum climber to guide ratio of 3:1. 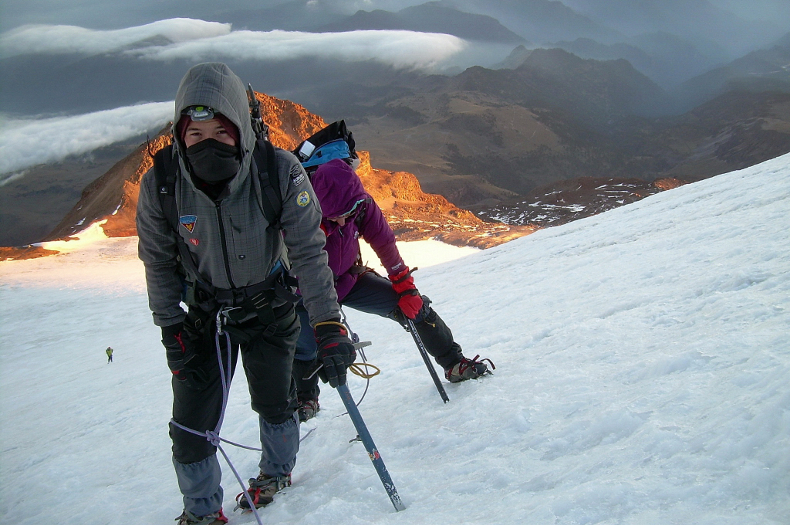 Alpenglow’s Mexican Volcanoes Climbing School is perfect for those who want to learn about climbing high altitude glaciated peaks while increasing their self-sufficiency in the mountains, but just can’t take 2-3 weeks off to travel to South America or the Himalaya. 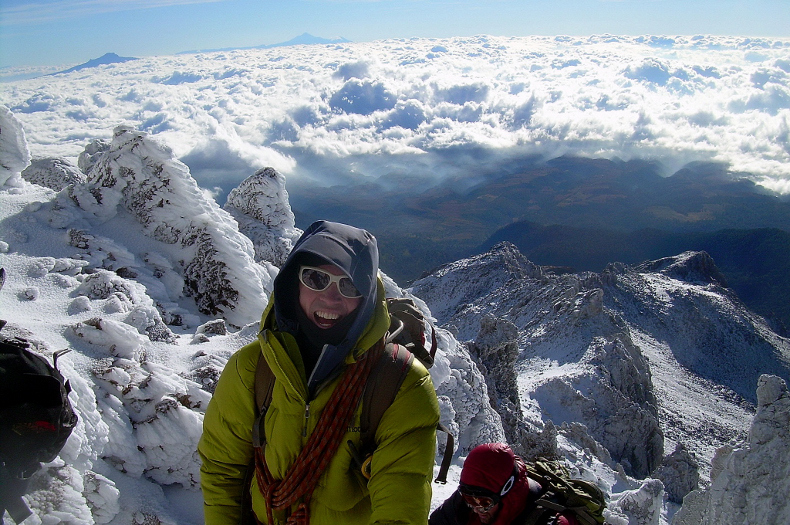 Mexico is one of the only places in the world where we can gain skills and summit peaks in just one week. 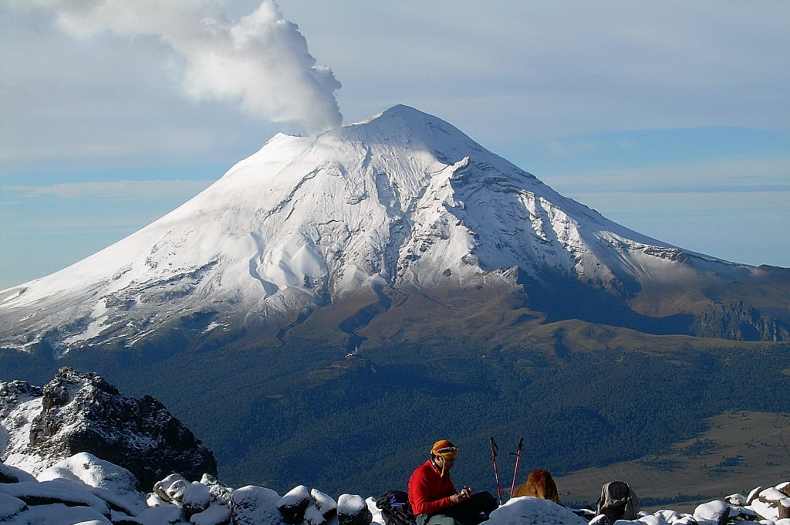 For the aspiring climber with no glacier experience, the Mexican volcanos school offer moderate glaciated routes at altitudes which can be attained with only a few days of acclimatization. Seasoned climbers shouldn’t discount this trip though – this expedition is also for the more experienced climber looking to refresh and dial in methods for glacier travel, crevasse rescue, and rope systems. Regardless of whether or where you have climbed in the past, this weeklong whirlwind climbing trip will satisfy your need to get to the big mountains again, and will build your technical skills and experience. It is an excellent introductory or refresher course with a focus on education, and a way to sneak some mountaineering into a busy life schedule! While learning skills in the Mexican volcanoes school, our classroom will be in the field while attempting two peaks during this trip. After a quick exploration of Mexico City and the surrounding highlands, we head to Iztaccihuatl. At 17,154 feet (5,229 meters), Ixta (as it is locally known) is Mexico’s third highest peak. It is the perfect mountain to acclimatize on, and while not highly technical, will provide an ideal opportunity to get used to traveling on rope teams and in crampons and is a beautiful route and summit. 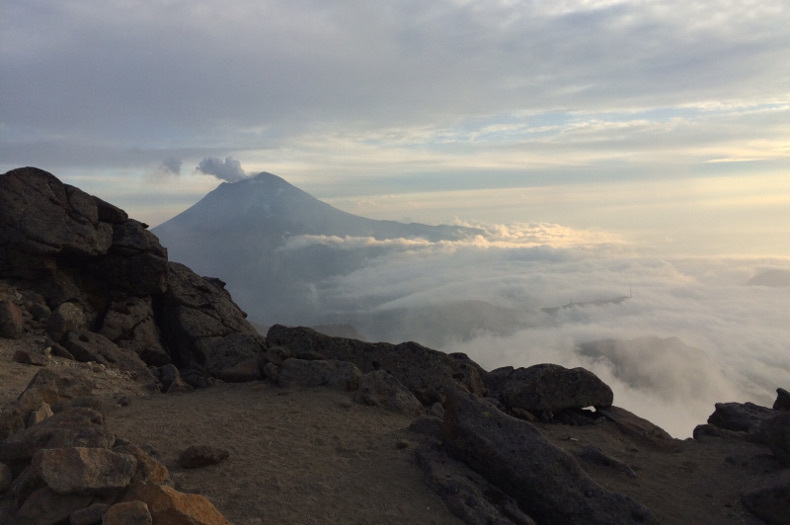 The view from the summit takes in all of the volcanoes of Mexico, including nearby Popo, which is currently erupting! On Ixta, we will ensure that everyone’s mountain skills are up to speed so that you are an able to be an active participant on the climbing and decision-making team. We then spend a day of rest and recovery in the traditional highland town of Puebla. The day will pass quickly exploring the local’s market, buying souvenirs, and eating the excellent Mexican cuisine. From Puebla we head to our second objective, Orizaba, where you will utilize the more technical skills learned on Ixta. As Mexico’s tallest peak and the third highest in North America its summit sits at 18,410 feet (5,611 meters) and is heavily glaciated. We will be technically and mentally prepared, as well as well-acclimatized and rested for our summit push, which is comparable to summit days on many of the world’s biggest peaks. The climb of over 4,000 vertical feet (1,020 meters) on crevassed glacier and steep slopes will test all of the training you have done throughout the week. 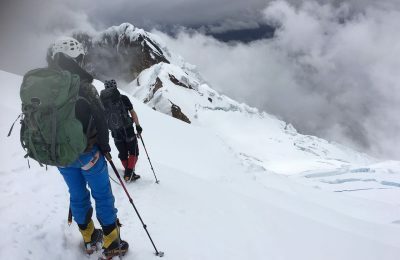 A summit of Orizaba and the skills you’ve learned to get there are excellent preparation for expeditions to mountains like Denali, Aconcagua, or Huascaran, as well as an achievement in its own right. 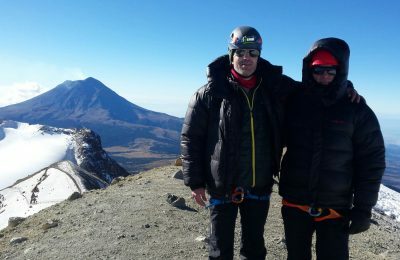 Our Mexico school will be guided by one or more of Alpenglow Expeditions’ AMGA certified lead guides. AMGA (American Mountain Guides Association) certification is the highest possible training available to guides, and only the most experienced and dedicated attain it. Our guides have also traveled and climbed extensively in North and South America. Their knowledge of the mountains, combined with their passion for teaching others to become competent mountaineers, guarantees that your experience will be one to remember and you’ll leave with many more skills to help you progress through the ranks of the big mountains of the world! In contrast to many guide services working in Mexico, we climb in small teams, with a maximum climber to guide ratio of 3:1. This helps ensure that you understand the systems you learn about, stay healthy and strong, and are able to enjoy each component of your experience. Most flights leave in the morning from major US hubs. Your guide will meet you at your airport and you’ll transfer to your hotel. After a quick stop at our hotel, we tour the city’s historic district, taking in the colonial architecture and beginning our process of acclimatization. We travel by 4WD Landcruisers to the town of Amecameca, in the Mexican highlands. This traditional town is famous for its market, and we take time to explore and have lunch before continuing our drive. 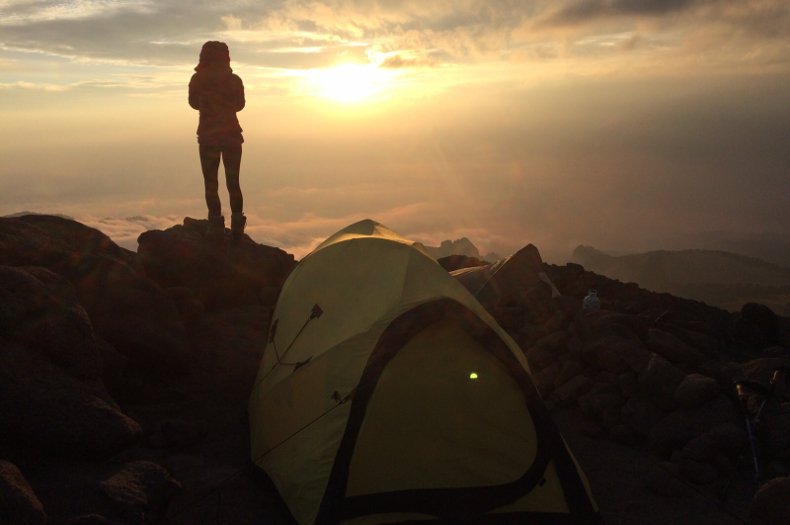 Spend the night in the Altzomoni Hut (13,000 feet, 3,060meters) on the flanks of our first objective, Iztaccihuatl. Today we take an acclimatization hike through the incredible pine forests that surround the base of Ixta, our first mountaineering objective. We also spend time today going over roped glacier travel, and familiarizing ourselves with crampons and axes. Today we move to a high camp at around 15,000 feet. Our packs will be heavy and the air thin, so we will move slowly, taking plenty of time to appreciate the incredible views as we climb out of the forests into the high alpine region of the mountain, all the while, continuing to practice our mountain travel skills. Wake up around 3 am for our summit push. After a quick breakfast and hot drink we begin our climb, up steep moraines to the edge of the glacier. After roping up and putting on crampons, we continue up the glacier, navigating occasional crevasses before it steepens into a final summit couloir. A final push puts us on top, where we have incredible views of all of the Mexican highlands. A long descent and quick drive will get us to much deserved showers, beds, and a celebration dinner in Amecameca (8,140 feet/2,489 meters). After a relaxing morning and big breakfast, we leave our hotel for the village of Puebla. The drive is incredible and gives us a good sense of the people of the highlands and how they live. Puebla sits at 7,000 feet (2,134 meters), and is a great place to recover fully in preparation for Orizaba. It is also the place to buy souvenirs for everyone at home! 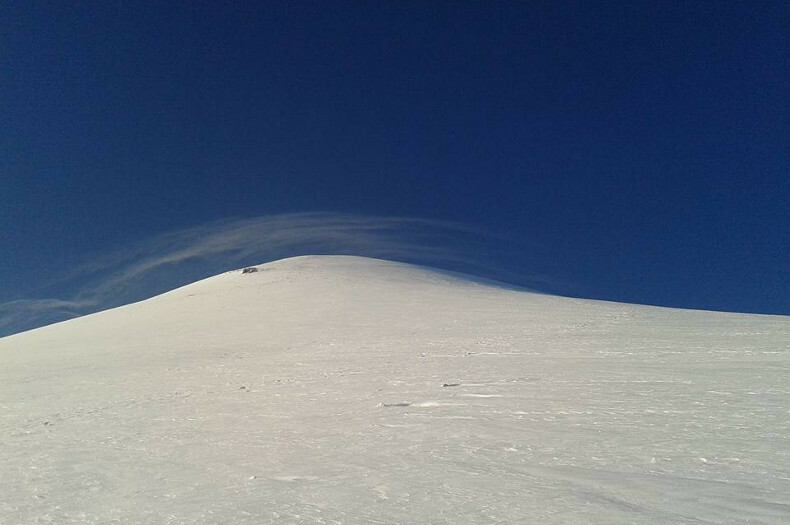 On the flanks of Orizaba, the Piedra Grande Hut serves as our home base for our final climb. We eat an early dinner, discuss our impending climb, organize our summit packs, and get to bed. Today is the day where your fitness training at home, your climb of Ixta, and your new skills really pay off. 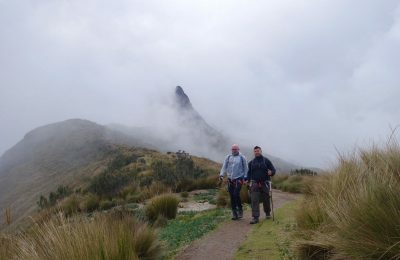 We wake soon after midnight and begin our climb to Orizaba’s summit. Moderate glacier climbing takes us around a rock band and over crevassed terrain before reaching the crater rim. From there we climb the ridge of the crater to the true summit. Our view will stretch from all of Mexico’s volcanoes on one side to the Gulf of Mexico on the other! We then descend back to the hut and drive to Puebla to celebrate our climb and spend the night. Wake early in the morning to drive back to Mexico City. Depart Mexico City for your flight home. Flights should not leave before 2pm from Mexico City. Would you consider organizing a custom expedition to Mexico? We love putting together custom expeditions. This provides more flexibility for you and provides the best overall expedition experience. Yes! The Mexico Climbing School is an entry level program, designed to teach you all the skills you need to begin your mountain climbing career. While you do need excellent general fitness, no climbing experience is necessary. Your longest, most difficult day will be summit days. We wake very early in the morning, using headlamps and warm layers. Climbing steadily through the night, we find ourselves high in the peak when the sun rises. After gaining the summit, we descend all the way back to base camp. You can expect between 12 and 15 hours of steady movement. We reserve the right to cancel any trip at any time. Reasons for cancellation might include (but are not limited to) political instability, natural disasters, or inadequate enrollment. If we cancel a trip prior to its start for low enrollment, we fully refund your payments. If we cancel your trip prior to its start due to political instability, natural disasters, or other reasons of that nature, we will refund all but non-recoverable costs. Changes to a trip itinerary made by our guides for any reason do not constitute a cancellation, and no refunds will be made in this case. If you cancel your trip more than 90 days prior to departure, Alpenglow Expeditions will refund your payment minus the non-refundable deposit. 60-89 days prior, Alpenglow Expeditions will refund 50% of your payment. Fewer than 60 days prior, there are no refunds or credits. On any trip, our guides reserve the right to remove any person, for any reason. These reasons generally stem from a person jeopardizing the safety of themselves or another team member. This includes a person who is not physically able to climb at the level necessary for the chosen route. In all these cases, there are no refunds whatsoever, and the client will be responsible for any additional costs incurred in leaving the trip. Armando was born in 1968 and began climbing at the age of 16. From then on, nature, adventure, and wall climbing have been his passions. His conquests range from the Alps to the Andes and the big walls of North America and the Karakorum. 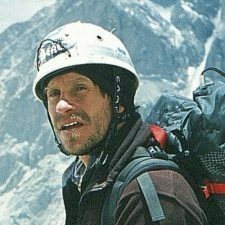 He was part of the Spanish Expedition to K2 led by Araceli Segarra. He has made two attempts on Trango Tower in Pakistan and has climbed El Capitan five times. Armando has been guiding the Mexican volcanoes since 1992. He completed his professional thesis in alpine equipment, obtaining a bachelor degree in Mechanical Engineering. 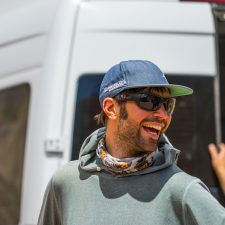 He is the Rock Climbing Advisor of Federacion Mexicana de Deportes de Montaña y Escalada. With all that adventure, he still drives his car slower than his grandmother….